Language-Learning Software OUINO Releases Version 3.0 – Now With Short Stories and Over 400 Lessons. 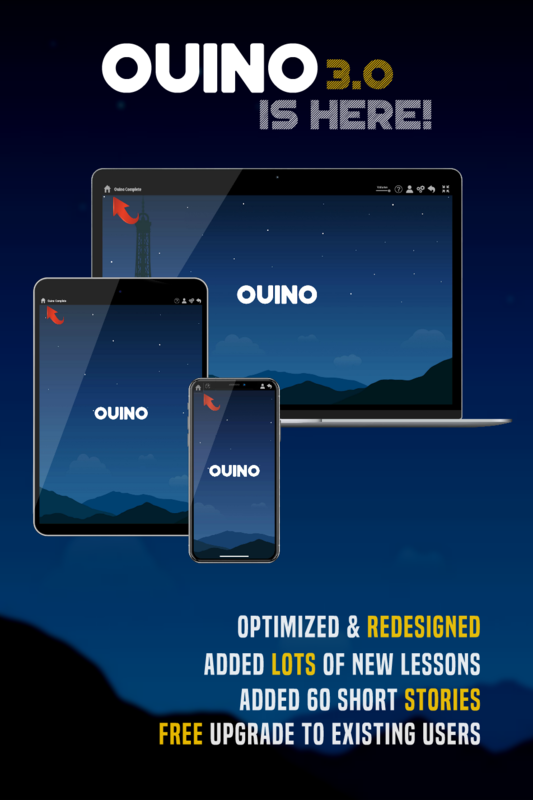 OUINO Technologies Inc. is pleased to launch OUINO 3.0, the third version of its language learning software, now packed with tons of new lessons and features for an even more comprehensive course, divided in over 400 lessons and over 1000 exercises of vocabulary, verbs and tenses, grammar rules and conversations. A lot of research has recently been made showing the effectiveness of reading comprehensible stories for language acquisition, but finding stories that you can understand when you are a beginner can be a challenge. These short stories tackle this issue. The first major addition in version 3.0 is the creation of an entirely new module called Express Verbs, which teaches over 150 additional verbs using an innovative approach that hits verbs from a new angle. “Learning verbs and conjugation is one of the pillars of language learning and it was already a part of the program our users loved. In OUINO 3.0, the Express Verbs section ties in together with the existing verb modules to bring the verb and conjugation learning experience to another level”, explained Tim Pelletier, co-founder of the company. Many other changes were made to the program including new lessons in virtually all modules of the course, now bringing the total count to over 400 lessons and over 1000 exercises of vocabulary, verbs and tenses, grammar rules and conversations. “Over the last few years, we took requests from thousands of users, we’ve developed lessons based on their needs and adapted them so it’s coherent with the conclusions of the most recent research in language acquisition. We believe our expertise in language learning combined to the suggestions of our enthusiast user community make OUINO 3.0 the best language course available on the market,” stated Tim Pelletier. OUINO 3.0 is compatible with Windows, Mac OS X, iOS, Android and Chrome OS and is available in 4 languages: French, Spanish, Italian and German. All existing OUINO users can upgrade to this new version free of charge. OUINO Languages was founded in 2010 and offers a multi-sensory, non-linear approach to language learning. It allows users to choose their learning material and to practice reading, speaking, pronunciation, writing, listening and visual association.